Gold Stick Fly Trap from Catchmaster is an easy to use glue trap to get rid of those pesky flies. Each Gold Stick Fly Trap has a powerful glue to capture each fly along with a cherry scented reflective surface to lure the flying insects in. Small Gold Sticks DOES NOT include fly attractant. Large Gold Sticks DOES include fly attractant. Gold Stick Fly Trap from Catchmaster is an easy to use glue trap to get rid of those pesky flies. Each Gold Stick Fly Trap has a powerful glue to capture each fly along with a cherry scented reflective surface to lure the flying insects in. Small Gold Sticks DOES NOT include fly attractant. 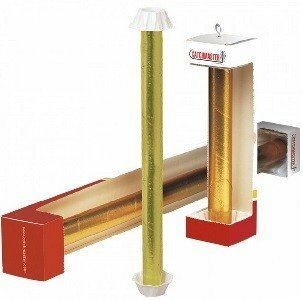 Gold Stick Fly traps can be used in homes, garages, sheds, warehouses, barnes, stables, dumpster areas, etc. Gold Stick Fly Traps can be placed horizontally on window sills or hung vertically.